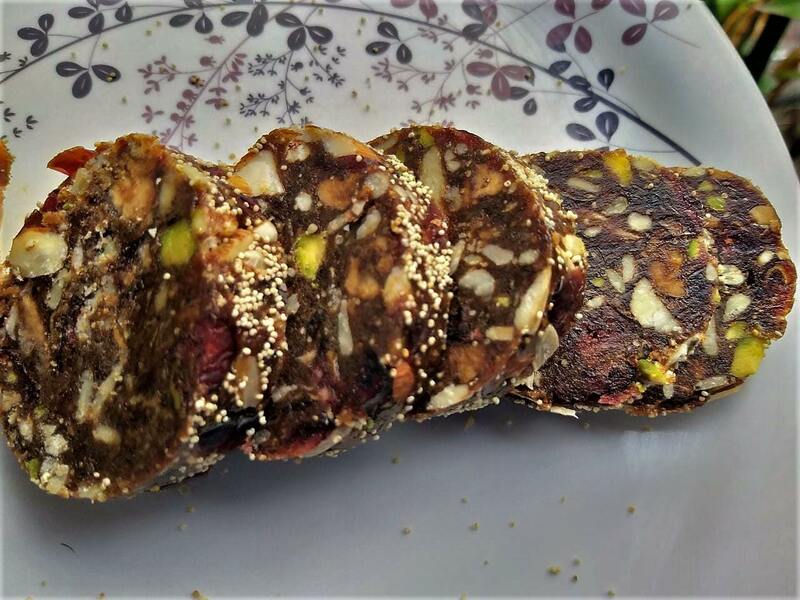 Sugar-Free Dates Dry Fruit Rolls for a sweet yet guilt-free Diwali Sweet that is quick to make yet healthy too! I know my husband’s love for dates and dry fruits the store brought ones are something in my current healthy food drive that I want to avoid at any cost. Thankfully now that he has given u his corporate job the boxes and boxes we used to get for the festive days has tapered down. I said tapered down so the few that we have also are something he is after. That is the time when Dhantadaaan … I gave him the roll and told him to slice the roll! Boy is he thrilled! He is posting it all around his groups! Entering this recipe for the A to Z Challenge this month wherein we choose to cook with key ingredients Alphabetically. This month it was time for Alphabet ‘D’ and I chose my key ingredient ‘Dates’ to make this gorgeous Diwali Sugar-Free Dates Dry Fruit Rolls. This is my first entry to the challenge I was oscillating between these rolls and a radish pachadi I make that is an absolute hit with my kids. Okay, maybe I will post it soon if I can find the pictures you see my laptops crashed and I am struggling with my daughter’s old laptop. I could also make it again and the girls will be more than happy! I am really blessed to have children who will shoot out of bed to eat salads! In this post, I have used standard grams please use the dry fruits as available and in whatever measure you care. This I have used all the leftover nuts before I open/buy new dry fruits. We had so many guests yesterday that I have not been able to click pictures. I will update the pictures asap. Heat a non-stick pan and roast the poppy seeds. In the same pan add the ghee and stir fry the nuts until you get a nice aroma. Set aside to cool. Add about 1- 1/2 tsp of the poppy seeds. Meanwhile, in the food processor or the mixer process the dates until it forms a soft lump. Transfer the nuts to the processor and run it to mix the nuts. Transfer to an aluminum foil and make a cylinder. Cut in circles using a sharp knife. Meanwhile in the food processer or the mixer process the dates until it forms a soft lump. Transfer the nuts to the processer and run it to mix the nuts. Transfer to a aluminium foil and make a cylinder. I loved the use of Walnuts, seeds and pecans for the dry fruit rolls. The Radish Pachadi also sounds good but like you, in my case too, Diwali sweets won the race but glad we both chose the sugar free versions. Happy Diwali to you and family. Very healthy sweet .. I make it often s it is sugar free and tasty as well. Healthy , sugar free and delicious!! These sugar free rolls are so tempting!! I call this a healthy and delicious snack and perfect for those small mid day hunger pangs. Looks yum and tasty. Whenever I make date rolls, love to add cranberries for that slight tangy taste. Such a healthy and yummy looking sweet treat. This dry fruits rolls is definitely a real torture, i dont mind munching some anytime. Well done Archana, those rolls are terrific. So rich with dry fruits and so healthy too!! Loved these rolls!! Ha ha! I can imagine your husband getting thrilled with slicing these date rolls! and how perfectly he has sliced them. 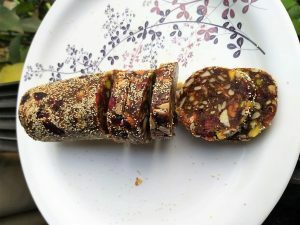 In our home, we make our own energy bars with dates and cranberries and a mix of dry fruits and seeds.. a lot like your date rolls and my husband loves to make them. Date rolls sounds amazing. We both made sugar free treat for the theme. And thanks a lot for sharing this wonderful recipe. Easy, delicious and healthy. I have got some more sugar free sweet recipes to make for my husband. Lovely share. These healthy rolls looks so delicious and perfectly done. This is such a healthy and guiltfree treat snack to enjoy with so many dryfruits in it. Love the addition of cranberry. Thanks for sharing such a healthy and tasty recipe. 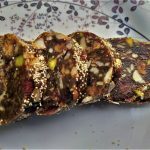 Absolutely love these dry fruit rolls and loved the use of walnuts, khus khus in it with dates. Nicely executed, delicious healthy recipe.YUMMY! Such a healthy snacks recipe with lots of dry fruits. Also sugarfree makes it more healthier.. It is lovely that we both made the same type of desert for the theme. I loved your addition of walnuts and cranberries. It will give such a good texture and taste to the rolls. Awesome Share !! these sugar free dates dry fruit rolls are perfect pre workout snack too. so healthy and tasty. Arch another lovely recipe from you. I love this theme. These dry fruit rolls look rich and delicious di ! Perfect healthy winter treats for kids and adults alike. I have to now make this dessert. So many of you have posted this and I am drooling over each pic.